Kirlian photography is a high voltage, contact print photography. Kirlian photography is named after Semyon Davidovich Kirlian and his wife Valentina who began their work with high voltage photography in 1939. Kirlian collaborated with his wife for over 30 years developing equipment and studying electro-photography. Kirlian's work was first made known to the general public in this country by a book published in 1970 by Shelia Ostrander and Lynn Schroeder titled "Psychic discoveries Behind the Iron Curtain". Kirlian work became so well know that the field of high voltage electro-photography is called Kirlian Photography. Although Kirlian wasn't the first to study electro-photography. The field of electro-photography can be traced back to the late 1700s. At this time Georg Christoph Lictenberg noted the pictures made in dust create by static electricity and electric sparks. Nicola Tesla (1880) photographed many corona discharges using his famous Tesla coil. In the early 1900s, Russian researcher Yakov Narkevich-Todka exhibited electro photographs he had made. A little later, Dr. F.F. Strong of Tufts University Medical School used a Tesla coil to make electro-photographs of his hand. The process is simple. Sheet film is placed on top of a metal plate, called the discharge or film plate. The object to photograph is placed on top of the film. If the object to be Kirlian photographed is inanimate, such as a coin or leaf, a earth ground is connected to the object. See figure 1 below. High voltage is applied to the plate momentarily to make an exposure. The corona discharge between the object and discharge plate passes through and is recorded onto the film. When the film is developed you have a Kirlian photograph of the object. The Kirlian process, being a contact print process, doesn't require the use of a camera or lens. However when a transparent electrode is substituted for the discharge plate it is possible to use a standard camera (with a bulb setting) or video camera. I was first introduced to Kirlian photography, by the book titled "Psychic Discoveries Behind the Iron Curtain" by Shelia Ostrander and Lynn Schroeder in the early 1970's. In it many paranormal claims were made concerning the resulting Kirlian images. For instances, it was said that the Kirlian photograph could foretell illness in plants and animals before physical manifestations of the disease became apparent. I have experimented with Kirlian photography over the years. I have not observed any "paranormal" evidence of this phenomena. One must keep in mind that most observable Kirlian phenomena does not require any paranormal or bio-plasma field to be explained. For instance, stress or the "act of lying" can easily be detected with a lie detector that relies on measuring the change in a person's galvanic skin resistance. Stress may also be seen in a Kirlian photograph as a change in the corona discharge (aura), however this change is easily explained by the change in a person's skin resistance without the need of evoking any metaphysical properties. The one observed phenomena and, the most amazing claim (in my opinion) is known as the "phantom leaf" experiment. 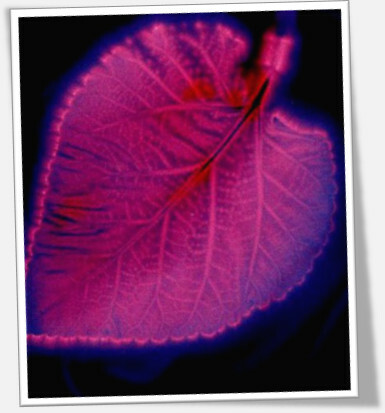 Here a small portion of a leaf is cut off; the leaf is then photographed using Kirlian photography. In a small percentage of cases the cut portion of the leaf appears in the photograph as a ghostly apparition. The appearance of the cut portion of the leaf, as claimed by the Soviet researchers is proof of an ethereal bio-plasma body. Although a few Kirlian researchers have claimed to duplicate the phantom leaf experiment in their own labs, the most reported successful results (phantom leaf photographs) are from Soviet researchers. The exact experimental parameters (voltage, frequency, etc) needed to obtain phantom leafs are either not available or didn't work for me. There are Kirlian devices being sold on the internet today. To sell their devices the corona discharge in the resulting kirlian photograph is claimed to be paranormal or hold information that can be decrypted by the company's Kirlian researchers. All my research to date shows the corona discharge can be explained by employing known physical laws, like changes in subjects skin resistance (due to factors like; stress-lying, illness, fatigue, alcohol consumption, etc) without the necessity of invoking paranormal (bio-plasma) factors. Some other variable factors influencing the resulting Kirlian picture including the object's pressure against film, air humidity, air pressure, voltage, frequency, and exposure time. This company also sells Kirlian devices and components, but we do not make any "paranormal" claims to try to sell our devices. Our devices are sold to make brilliant Kirlian photographs. If one wants to do research with our devices that fine also. Just know we make no claim that any interpretation of the corona discharge is due to anything other than standard variable physical parameters as outlined previously. The next page we will begin the construction of a simple manual kirlian device. This device uses a battery power supply, high voltage ignition coild, copper clad board and a handful of components.